A brand new rocket that may one day launch the firstcommercial spaceship to carry people to orbit could make its first test as soonas May 28 according to the U.S. Air Force, SPACE.com has learned. The Falcon9 rocket, built by Space Exploration Technologies (SpaceX) of Hawthorne,Calif., already has a contract with NASA to haul cargo to the InternationalSpace Station. Eventually, it could be modified to launch humans as well, companyofficials said. "We've been thinking about crew from the verybeginning," said Ken Bowersox, SpaceX vice president of astronaut safetyand mission assurance. But for now, the Falcon 9 rocket's upcoming unmanned flighttest is the next step. The launch debut from Florida's Cape Canaveral AirForce Station had been tentatively slated for May 23, but will likely be pushedback a bit until safety managers can approve the rocket's emergency destructsystem. "I think we're getting really close," Bowersoxtold SPACE.com. Bowersox is a former NASA astronaut who flew four space shuttlemissions and one long-duration flight to the International Space Station. The main hurdle for SpaceX's Falcon 9 launch debut is thepending final approval of the rocket's flight termination system, an explosivecharge designed to destroy the rocket if something goes wrong and it flies offcourse. "That's typically one of the last things that getsworked out on a new vehicle," Bowersox said. Aside from that, the 178-foot (54-meter) tall Falcon 9rocket is all set to launch from the company's dedicated launch pad in CapeCanaveral. It is the second rocket to join SpaceX's booster fleet. Thecompany's smaller Falcon 1 rocket is currently used to launch satellites intoorbit from Kwajalein Atoll on the Pacific Ocean. The first Falcon 9 rocket will carry a mock version ofSpaceX's gumdrop-shaped Dragoncapsule, which is designed to carry cargo, and potentially, humans. 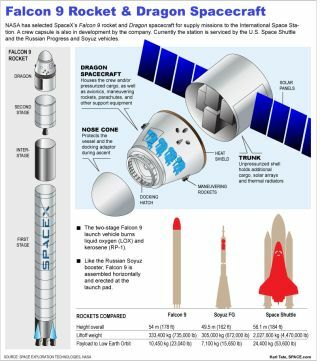 It isthe Dragon capsule which SpaceX will use to supply unmanned cargo shipments tothe space station for NASA and return items to Earth. SpaceX has a $1.6 billion contract with NASA to provide 12Dragon flights for unmanned cargo deliveries to the space station. NASA hasalso signed the Virginia-based company Orbital Sciences to a $1.9 billioncontract to use its new Taurus 2 rocket and Cygnus spacecraft to fly eightcargo missions to the station. Another issue affecting Falcon 9's launch date is thecrowded range at Cape Canaveral. SpaceX will likely have to squeeze its launchbetween the landing of the space shuttle Atlantis, planned for May 26, and theMay 21 launch of the unmanned Delta 4 rocket. "We need at least a day and half to turn the rangearound," said Eric Brian, spokesman for the 45th Space Wing at CapeCanaveral Air Force Station. He said SpaceX has requested May 28 and May 29 aspossible launch dates, though final approval by the Air Force is still pending. When the test flight does take place, the launch team isn'tsure what to expect, since this will be the first countdown of an untriedrocket. "There is a good chance of seeing an anomaly (vehicleor ground side) on the first flight countdown that we have to investigate,"SpaceX CEO Elon Musk told SPACE.com. If all does go well, though, the second Falcon 9 launchcould be the first SpaceX flight to carry real cargo and begin deliveringsupplies to the space station. Whatever happens, anticipation is mounting within therelatively small, upstart company. "Folks are getting very excited," Bowersox said. "Itwill be the culmination of years of work on our big rocket."